Snapchat vs. Instagram Stories: Which Is Better for Your Brand? If you’ve been avoiding Snapchat because you didn’t want to feel like the lone creepy old person on the channel, it’s past time to rethink that strategy. Not only has Snapchat thrust its way into the mainstream, but it’s been joined by copycat Instagram Stories — and it’s time your brand examined both and figured out which one to build a presence on. Though the two are similar, don’t assume they’re identical. Before you make a decision about how to use Snapchat or Instagram Stories, it’s important you first understand what these channels can — and can’t — do for your brand. Just when we knew how to explain Facebook, Twitter and Instagram to key stakeholders, Snapchat threw everything marketers knew out the window faster than you can say “puppy dog lens.” Though Snapchat has its share of fluff, several large brands have found opportunities to use even the most ridiculous Snapchat features to promote their products. Once largely viewed as a sexting app, Snapchat has matured beyond its early years and is now used by major brands such as McDonald’s, Taco Bell, Forbes and the White House. Use of Snapchat among 18-24 year-olds has grown from 24 percent in 2013 to 69 percent in 2016, according to comScore. The number of 25-34 year-olds on the app has grown from 5 percent to 38 percent in those three years. The channel is also seeing growth — albeit slower — among the 35+ audience. According to Adweek, more than 60 percent of smartphone owners between the ages of 13-34 have a Snapchat account. Why has Snapchat grown so quickly? As Facebook became more popular with the middle-aged set, teens flocked to the Snapchat to get away from their parents and grandparents. Now, sending a snap is as natural for younger generations as making a phone call is for older generations. Likewise, because likes and shares are not part of the Snapchat experience, the channel is more attractive to social users who are tired of the pressure associated with using social media. However… While users appreciate the lack of likes and shares, the absence of these functionalities limits brands’ abilities to create digital brand advocates out of their followers. Instagram has taken some flack for creating a tool that is essentially a carbon copy of Snapchat, but all is fair in love and social media. Channels are constantly “borrowing” functionalities from other channels in an effort to stay relevant. Just recently Instagram began featuring discoverable Stories, making them more visible to a larger audience. Up to this point, though, these discoverable stories have included individuals only — not brands. 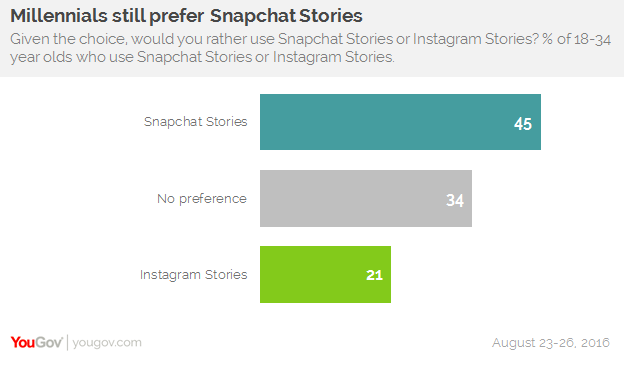 In a YouGov.UK survey that asked Snapchat and Instagram users which channel they preferred,only 1 in 5 responded that they preferred Instagram Stories to Snapchat. Despite this, not long after Instagram Stories launched, Nike reported that it received 800,000 views on an Instagram Story that yielded just 66,000 views on Snapchat. People tend to stay with Snapchat stories longer than with Instagram Stories. According to a test performed by Al Jazeera after they launched Instagram Stories, the organization lost 40 percent of its viewers by the second shot. However, on Snapchat, between 50-75 percent of followers stuck with a story all the way through, even when the stories were long. Snapchat stories don’t need to be polished or cost a lot. Your organization doesn’t need a huge marketing budget to have a presence on Snapchat. 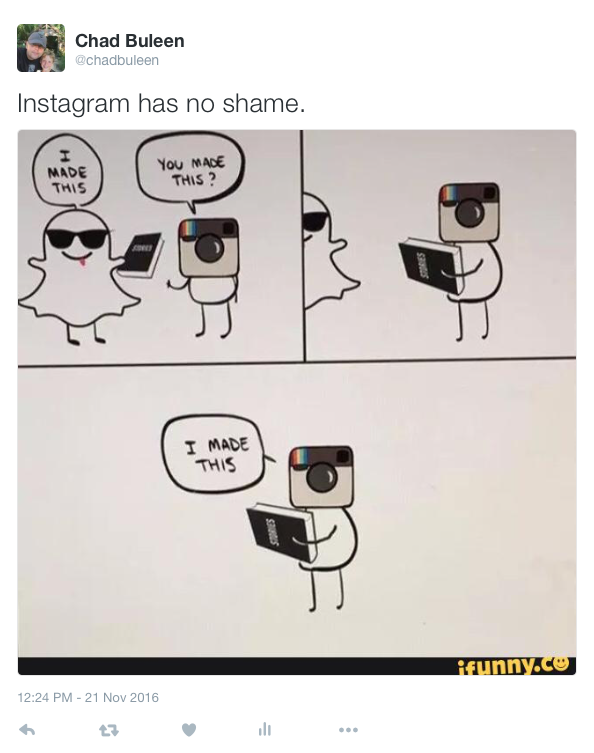 In fact, the success of your Snapchat account may depend much more on your creativity than your budget. Taco Bell is an example of one brand that has used Snapchat to produce valuable — yet inexpensive — content. Anyone in your company can pre-approve content that appears in Instagram Stories. Meaning that the person publishing to your social channels doesn’t need to make the final call about if a piece of content is good to go. If you already have followers on Instagram, then you have a built-in audience for your Instagram Stories. Instagram Stories can supplement your existing Instagram content and Instagram delivers them in a way that is virtually impossible for your audience to miss. If you want to see what your team is creating before it is published, Snapchat doesn’t make things easy on you. Unless content is uploaded as a Snapchat Memory (which hasn’t really caught on yet), the only way you can approve a Snapchat story before it goes live would be foryou to be on location while the story is being shot. If you work in an organization that prides itself on creating top-quality content, getting your leadership to understand the value of less-than-polished, in-the-moment content could be a hard sell. Snapchat is a lot of things — but a place for serious, high-quality content it is not (see below). Love analytics? Snapchat doesn’t give you much to work with. It will let you know how many people viewed your snap and how many times it was screen-grabbed. You can also easily figure out the audience retention rate from the beginning of the story to the end. That’s pretty much it. In fact, Snapchat doesn’t even tell you how many followers you have. Your best bet is to guesstimate based on how many views your stories are getting. Want to promote your Snapchat account? You better have other channels you can use to do so. There is really no way for a person to find your Snapchat account within Snapchat. Not having likes and shares means that there is very little visibility for brands. Your best bet is to use your other channels (social, blog, email) to promote your Snapchat account. Be warned, though, thatFacebook and Twitter are discouraging you from using your snap code as your profile image. Analytics for Instagram Stories is even less robust than Snapchat. With Instagram Stories, you can see how many people and specifically, who, has watched your Stories. That’s pretty much it for now. You can’t choose how long an image stays on screen when someone views your Instagram Stories. When using Snapchat, you can select up to 10 seconds for a photo or video to stay on screen. On Instagram Stories, videos can also last up to 10 seconds, but photos only show up for a speedy 3 seconds. Many teens and millennials made up their mind a long time ago about which channel they want to use for sharing their stories. Given that Instagram Stories is a copycat of Snapchat, it still seems to have a long way to go to supplant Snapchat as the go-to app for story-based content from users. Snapchat hasn’t made it easy for marketers to promote their brands on the channel unless organizations are willing to pay major money for ad spend. On the other hand, Instagram Stories almost seem as if they were built specifically for brands. If you already have a large following on Instagram, chances are that you will get the most bang for your buck by concentrating your marketing efforts there. However, if you haven’t yet built up an audience, it’s pretty clear that young audiences still prefer to engage with Snapchat stories. More than 10 billion video views per day can’t be wrong. Whom are you trying to reach? Looking to reach middle-aged moms? Retirees? Golf enthusiasts? If yes, Snapchat and Instagram Stories might not work for you. As I mentioned earlier, audiences for Snapchat and Instagram Stories skew younger. Though older audiences are adopting these channels, they aren’t doing it at a rate that is quick enough to warrant you being on these channels yet. It might be better to continue to keep an eye on user trends for now. Do you have a content strategy? Your strategy should be independent of any specific channel. Consider the message of who you are as a brand. What’s your story? What should digital audiences know about you or how your product can help them? Why should they care? What are your goals? Make sure you know the answers to these questions before you attempt to create content on any social channel, including Snapchat and Instagram. Will you need to show ROI? If your CEO will want to see a direct correlation between Snapchat views and sales, you’re going to have a hard time. Currently, Snapchat makes it nearly impossible for an organization to send users back to a website or blog as part of a sales funnel. Instagram Stories has started to roll out the sharing of links, but it is not yet clear if this will be accessible to everyone and it remains to be seen what kind of analytics Instagram will provide. If you have the resources to be on both, great. Perhaps you have the staff, budget and know-how to have a solid presence on both platforms. By all means, go for it — just remember, if you can’t do it well, it’s better not to do it at all.